Evergreen Options is a voluntary program that allows Tacoma Power customers to buy electricity produced from renewable sources through renewable energy certificates (RECs). In the fall of 2017, Tacoma Power launched an innovative grant program for local schools, nonprofits and government agencies to submit proposals for deploying their own renewable energy projects. This annual grant program helps recipients generate a portion of their own electricity from renewable sources including wind, solar, geothermal, landfill gas, wave or tidal, biomass, gas produced during the treatment of wastewater, and qualified hydropower. Recipients can also get credit for any extra electricity provided back to the utility. Funding comes from Tacoma Power residential and business customers who participate in the Evergreen Options program. The Tacoma Housing Authority will use the $50,000 grant to integrate solar panels into the Crisis Residential Center (CRC) at its new Arlington Drive Campus, which will break ground in 2019. The CRC will be a twelve-bed facility to house, serve and save homeless youth ages 12 to 17. The CRC will be part of a larger campus that will also serve homeless young adults ages 18 to 24. The total capacity of the new solar energy system will be 21 kilowatts. 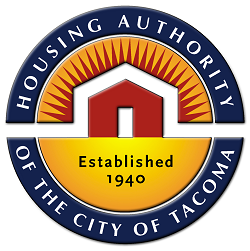 Learn more about the Tacoma Housing Authority by visiting their website. Bates Technical College is a two-year public institution that has been providing quality training and education to Tacoma/Pierce County for 80 years. The college is known for its commitment to helping students find family-wage level employment. The $41,500 renewable energy grant will allow the school to install solar lighting at its south campus parking lots, which will increase safety and support energy conservation. It is estimated that the project will produce 3,728 kilowatt hours of electricity per year. 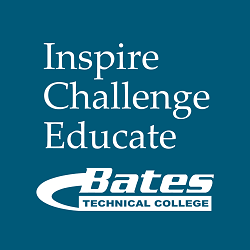 Learn more about Bates Technical College by visiting their website. The site of this project will be the ‘Asian Forest Sanctuary’ area within the zoo. This building is the overnight home (indoor holding) to a number of species in the zoo’s collection, including the Indian Crested Porcupine, Lowland Anoa, Malayan Tapir, and Sumatran Tiger. Point Defiance Zoo & Aquarium staff and consultants chose this building from NW Wind and Solar, as they conducted an assessment throughout zoo grounds. The building was chosen for its proximity to the sun and easterly position, for greater potential to generate power, and for its public access along one of the main thoroughfares on Zoo grounds. Though the panels themselves may not be greatly visible, signage from our graphics department will be accessible to visitors to share information on our solar program and interpreters from our education department will share with the public how they may become invested in their own homes. We are also pursuing the possibility of real time monitoring of how much power has been generated from this project that could be displayed to the public on a digital reader. A total of 86 iTek energy modules will be installed on a ballast mounting system for a system size of 25.80 kW, all made here in Washington state to encourage participation in local business and innovation. 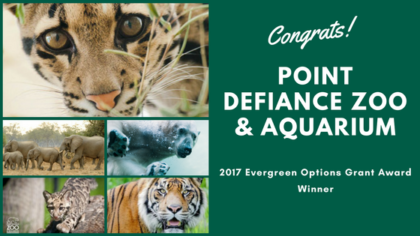 Additionally, Point Defiance Zoo & Aquarium believes so much in ‘walking the talk’, our facility had decided to match the grant amount (increasing the number of energy modules from 40 to 86) in order to maximize the possibilities made available by the Evergreen Grant program, and to echo the community’s vested interest in the future. Applications will be accepted April 1 through July 31, 2019. All Tacoma Power residential and business customers can support regional renewable energy development by enrolling in the Evergreen Options program. For as little as $3 a month, you can match a portion of your electricity use with renewable energy from the Pacific Northwest.If you have questions, or if you would like to have a Tacoma Power representative come talk to your organization about the program and grant opportunities, email us at evergreen@cityoftacoma.org. Applicants must be an Evergreen Options participant to qualify for grant funding.